Vichet Chum and Kelsey Wang in A Dream of Red Pavilions. Photo by John Quincy Lee. BOTTOM LINE: A whirlwind adaptation of a classic Chinese tale about an ill-fated romance and a family’s fall from grace. Originally written in the 18th century, Cao Xueqin’s novel A Dream of Red Pavilions is one of China’s most beloved classics. Yet, most people outside of Asia have never heard of this epic, even after many translations. Thankfully Jeremy Tiang has joined the ranks of adapters before him introducing this story to the world—perhaps where written translations failed, the stage can better show what makes A Dream of Red Pavilions beautiful and timeless. Framed in a gorgeous mixture of projections and sound, the story opens in the Spirit World where we meet our fated lovers: a sentient Stone who longs to experience humanity, and a Flower who admires him. In their separate journeys, the Stone and the Flower manifest as cousins in the aristocratic Jia family. The Stone is born as Jia Baoyu (Vichet Chum), a carefree soul who would rather write poetry than study for the imperial exam. 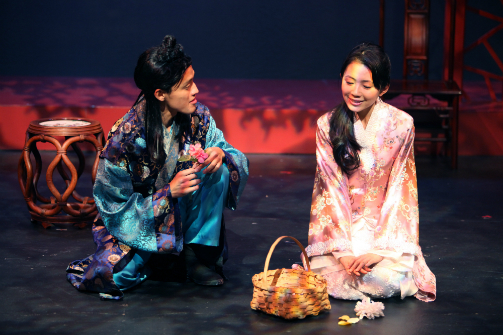 The Flower is born as the studious Lin Daiyu (Kelsey Wang) who shares in Baoyu’s love for poetry. As the kindred spirits grow older, Baoyu and Daiyu fall in love, promising to spend the rest of their lives with each other. But Daiyu’s been sickly since her childhood, which concerns Baoyu’s family—they feel his other cousin, the savvy Baochai (Leanne Cabrera), would make a far better match. The scope of A Dream of Red Pavilions expands far beyond the fateful lives of our star-crossed lovers. We are offered a multi-faceted portrait of the family’s day-to-day affairs. The house itself, and its finances, are run by Wang Xifeng (Allison Hiroto), a capable and resourceful woman, but her pride eventually becomes the family’s downfall as she begins loan sharking in order to make ends meet. And binding the household together are Baoyu’s erudite father Jia Zheng (Fenton Li) and the family Matriarch, played with unwavering strength and poise by Shigeko Sara Suga. Further still, the audience never forgets the force of the Spirit World. Throughout the play we meet characters like the mysterious Fairy False and the ghost of Jia Yuanchun, both played by the extraordinary Mandarin Wu. Both characters act as bridges between mortal world and the Spirit World, and they foretell the fates of the Jia family. Xueqin’s original novel weaves together even more subplots, but Tiang picks out the moments that both focus on the most principal themes and show the grandeur of this epic. Along with Tisa Chang and Lu Yu’s detailed direction, the audience can follow the many stories without feeling entirely lost. But, in keeping all of these elements the play often dragged—A Dream of Red Pavilions is a long play and it feels long. With that said, the piece succeeds in two significant ways. First, on top of notable performances, the design is enough to take your breath away. Hyun Sook Kim’s costumes are gorgeous. And the seamless mixture of Victor En Yu Tan’s lighting, Douglas Macur’s projections, and Angel Lam’s music immerses the audience in this larger-than-life world. There’s a tragically beautiful scene towards the end where the family has officially lost favor with the emperor and they’re engulfed in snow; the stage fades nearly to black, leaving us only with projections of snow falling, so a character’s even slight turn gave the effect they were spinning out of control. Second, although I’m not entirely convinced the play translates well to Western audiences, it definitely upheld the Pan Asian Repertory’s mission to expose American audiences to Asian and Asian American arts. I for one am so intrigued by this story I can’t wait to read the novel for myself. If you’re looking for theatre that teaches you something new, definitely check out A Dream of Red Pavilions. A Dream of Red Pavilions is written by Jeremy Tiang, adapted from the novel by Cao Xueqin. Directed by Tisa Chang and Lu Yu. Set design is by Sheryl Liu. Costumes by Hyun Sook Kim. Lighting design is by Victor En Yu Tan. Projections are by Douglas Macur. Original music is by Angel Lam. Sound design is by Ian Wehrle. Stage Manager is Elis C. Arroyo. Assistant Stage Manager is Miriam Hyfler. The cast is E.J. An, Leanne Cabrera, Amanda Centeno, Vichet Chum, Allison Hiroto, Fenton Li, Shigeko Sara Suga, Audrey Wang, Kelsey Wang, and Mandarin Wu.